Edith first met the group of nine young men during the Occupation. They were performing in a concert at the Comedie Francaise; Edith appreciated their talent but deplored their lack of proper training and choice of song - simple camp-fire tunes and folk harmonies. She dubbed them her "Boy Scouts", leased 26 rue de Berri, moved them in and began teaching. 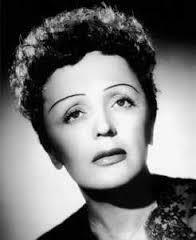 In 1944 she was given a song written by a young singer/composer named Jean Villard. She hadn't decided to sing it herself as she felt it needed more voices. She offered it to Les Compagnons who asked if she would sing it with them. The song was Les Trois Cloches. It was soon after translated into what we know as "Jimmy Brown".